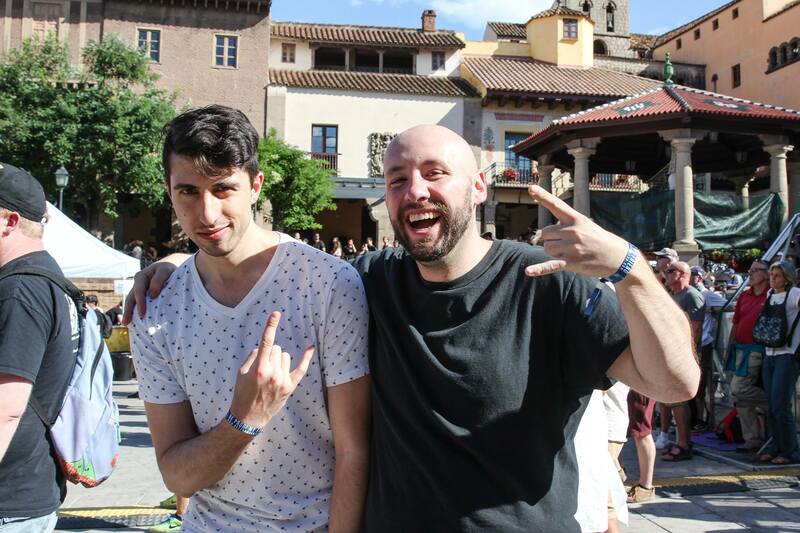 Metalscript.Net met American musicians, who had recently traveled Europe on tour with Leprous, during the trip to the epicenter of the progressive musical subculture in Spain, which is fairly considered to be Be Prog! My Friend festival. – It was my first ever music festival experience. I think it’s a really beautiful setting with a diversity of artists and many wonderful, intensely-thinking/feeling people assembled to share in something that we all care deeply about – music, – tells Earthside’s guitarist Jamie van Dyck. – I quite liked those special events like Devin Townsend Project playing the whole Ocean Machine album, Leprous playing a by-request set including songs that they don’t normally play live in recent shows, and Shattered Fortress assembling musicians from the scene around Mike Portnoy to play the songs he composed for Dream Theater around his experience battling his addictions with alcohol. I think that the festival organizer does a very good job balancing the new with the old, the heavy with the melancholic, and it would be a very cool event for Earthside to partake in someday. – I planned my trip around Europe and decided to include this festival on my trip as an interesting musical experience and a chance catch up with our European friends, and, of course, to meet new people,– says keyboardist Frank Sacramone. – There were bands in the lineup that I hadn’t seen before such as Devin Townsend and Anathema, so I thought this would be a good opportunity to see them. I also wanted to check out the festival to see what it would be like if Earthside performed there. Also for me, a pleasant surprise was the opening band Jardin de la Croix! In spite of being first on the bill, they brought enormous energy and excellent stage presence while performing compelling music. They really had an epic blend of post-rock, alternative, and progressive. – By the way, what bands are currently on repeat in your playlist? J: – From the recent… Leprous has been my favorite progressive rock band over the last few years, and they were fantastic in closing Be Prog! My Friend. Karnivool, despite taking 4-5 years to release each album, is 3-for-3 with me so far in putting out records that I love and end up getting great replay value out of. Before that, bands like Porcupine Tree and Sevendust were my favorites. Recently, I’ve also gone back and listened to a lot of 90s Bjork that I only recently discovered. Another recent love is the debut album from Our Oceans (formerly the guys in Exivious), which has lots of really beautiful, emotional music on it. – Let’s talk a little more about festivals and tours. Would you like to perform at Be Prog, for example, the next year? What countries do you want to visit with a concert? F: – I think it would be a great experience! The fans have a lot of energy, and I think that would really vibe well with an Earthside set. The large screen in the back of the stage would be perfect for our cinematic backing videos and give the concert goers an even more intense Earthside set. Also, playing amongst other talented bands is always a rewarding experience. J: – In addition to Be Prog, I would love for Earthside to belatedly fulfill our promise of playing ProgPower Europe. We’re still grateful to Rene for inviting us to play our first ever festival last year, and while it didn’t work out, we’d still quite like for it to happen if we can build the right tour around it. Euroblast that same weekend nearby would be great. Other European festivals I’m aware of that I’d be quite excited about are UK Tech Fest, ArcTanGent, ARTMania, Rockstadt Extreme, and some of the bigger festivals like Download among many other festivals, both progressive and otherwise. Talking about the countries … in fact – we could go wherever there is a culture of music appreciation and new music discovery. Some countries where we’ve seen evidence of this in our genre that we haven’t played yet include France, Finland, Serbia, and Romania, as well as much of Latin America. – And how about Belarus? – As far as we know, we have not really a lot of fans in Belarus, so it would have to be the right opportunity to expose our music to the Belarusian people. We also are at a point in our career development where we’re less likely to perform headlining gigs in Europe, but rather support a bigger band on tour. If that band is coming to Belarus, we’ll be there, and we’ll be very excited to share our music and spend an evening with Belarus’s finest music appreciators. – Do you know any progressive teams from our country? F: – I was recommended to get acquainted with the work of some Belarusian groups, including the Re1ikt group, and I liked their song “Chadzila Halota”. It started with an interesting folky intro that incorporated winds and acoustic guitars. Then it evolved into the rock instrumentation, and I thought the incorporation of both the folky and rock elements was really cool, brought out a unique sound of the region. – Your debut album was released two years ago, but I think that the Belarusian listeners mostly are not familiar with it. So, if you allow, a few questions about “A Dream in Static”. How was the idea of the album born? J: – The album evolved naturally out of what we were feeling at the time of writing. We knew that we had these massive ambitions musically of what we wanted to create and accomplish, but we felt afraid and anxious that due to our own internal limitations and external obstacles beyond our control, we were putting in all this effort and emotional energy to go nowhere. The album became very self-referential as far as writing about the very thing we were trying to accomplish with this album. – Do you have any favorite songs on the album? Which one would you recommend to listen to first? – Well personally, I’m not sure that I’ll ever be more proud of or emotionally connected to anything that I write than “Mob Mentality” due to the endeavor that it was to write and everything that happened as part of composing that song. As a group, I’m most proud of “Skyline”, especially what we were able to accomplish in the 2nd half with the dotted rhythm of the piano against the 4/4 drum groove and building everything around the tension and release of that idea, and then resolving and erupting in what to me is a really glorious climax. – “Mob Mentality” began as my senior project to complete the Yale music major at the end of university/college. I had always wanted to compose something that combined my passion for symphonic music with rock and metal, and I’d wanted the challenge of composing and arranging the orchestra myself, rather than hiring an outside orchestrator as many rock/metal acts have done in the past. “Mob Mentality” confronts themes of mortality and questions of legacy and life’s purpose. I was constantly feeling pressure in all different directions, people, and from society at large to fulfill their vision of “success” rather than my own. I composed this song as a manifesto of sorts to myself and hopefully to others to stay in touch with your identity and what will give your life meaning in the longterm, and not get pulled away from it by more immediate enticements or easier ways out that can lead you down a path of convenience, but 20 years later leave you feeling that you didn’t accomplish what you’d set out to. Our dreams are worth fighting for! Partway into composing this song, my dear friend from college Ugonna Igweatu with whom I’d just spent the weekend collaborating on and recording his original music at my house suddenly passed away the next day at the age of 24 from a severe asthma attack. The pain of his loss and the thought of all the beautiful music he never got the chance to make added more urgency to these themes within “Mob Mentality” and put me more in touch with the vulnerability of the fear that perhaps these dreams will never be realized, and I can only fight for them while I’m here. A day that I’m alive such as today is my best chance to do it. As they say “we’re only guaranteed today” as the cliché goes. While I still feel that I have plenty more to accomplish before I’ll ever feel satisfied (a similar feeling to how I’m sure my band mates feel), having finished and released this song and this album does feel like a weight off our shoulders as far as feeling that we’ve accomplished SOMETHING that we’d set out to and that is reflective of us as artists and as human beings. It was also a life dream to collaborate with Lajon Witherspoon on a song as I’ve always found his voice resonated with me and Sevendust was always one of my favorite bands. I’d shared Sevendust’s music and LJ’s voice with Ugonna back in our college days when we were first becoming friends, so it’s fitting that LJ gave a voice to the song dedicated to and in part inspired by my dear friend. – And Frank, how was “Contemplation of the beautiful” written? F: – Contemplation began as a song that would embody all of my fears, anxiety, and depression up to that point in my life. I knew it had to be compelling or it would fall short of what I needed it to express. When composing and arranging the music, I had to make sure that every element served a purpose in relation to my emotions. The guitars, bass, and drums were all recorded at a faster tempo than the original song, and then were pitch and time shifted to the intended key and tempo I wanted them. This represented the way in which I felt like I was being dragged down, bearing the weight of my inner suffering. Vocally, I needed someone who could sing-scream, someone who could sound like they were crying for their last breath. We had previously known Eric Zirlinger for a little while, and knew he was capable of great things with his voice. He pushed his voice to such an incredible degree of power that it embodied everything I ever hoped for in Contemplation. I’m very happy with the way the song turned out, and it was an important step in my development as a songwriter, producer, and musician. – How did you choose the vocalists for your songs – there are several of them and everyone has his own specific? J: – We compose the songs first. For the songs we write where we’ve either written a vocal part already or at least hear a vocal part enhancing the song, then we imagine the kind of voice we want to express those emotions, or the technical abilities we need to execute the specific vision we have for that song, whether it be low/high notes, screams, a beautiful falsetto, a pure or gritty voice… things of that nature. Also the feeling that a vocalist gives us when we listen to him or her in their own band and the feeling that we’re wishing to create with our song. That said, we also quite enjoy and prefer to use vocalists in ways that they aren’t often used primarily in their own band. For instance, having Björn sing delicately in the verses and almost exclusively sing rather than scream is a different approach from most Soilwork. Also, Lajon singing on a 10-minute orchestral song is quite different from Sevendust. Eric Zirlinger delivers the heaviest vocal performance on arguably the heaviest song on our album, while his own band Face the King is arguably the least metal band of any of our vocalist collaborators. – But do you see Earthside more as an instrumental band or you plan to invite a regular singer into the band in the future? – As things stand currently, we intend to continue the model of the first album with a mix of instrumental compositions and songs that feature guest vocalists of different ranges, emotional qualities, and timbres. The songs that we compose call for a variety of approaches, and we let the songs dictate. Now we are composing new material, and will hopefully move towards recording it sooner than later once we feel fairly solid with the songs that we’re choosing to make it to the studio session phase. We may have a couple more to write before we get to that selection phase, and may also shelf a few really good ideas for a future album that don’t fit the themes of this album that we’ve been writing, but we feel are worthy of being on a future Earthside record.